“You have to change yourselves, if you want to be able to help the others to change” said Linda Mayoux, Oxfam Novib Consultant and technical facilitator in the 12 days-long learning route through Rwanda and Uganda. A learning route is a journey for participants to experience with their eyes and their ears the changes that have occurred in men and women’s lives, learning directly from them. This journey gets participants to understand these changes through peer-learning, discussing directly with rural communities how proud they are of their achievements, the challenges they fear and plans for the future. A learning route is in first place an experience that transforms its participants because of what they learn, leading them to become agents of change in their own organizations. PROCASUR, in partnership with Oxfam Novib and IFAD has started the learning route “Boosting the contribution of value chain development to gender justice and pro-poor wealth creation: the gender action learning system (GALS)”. 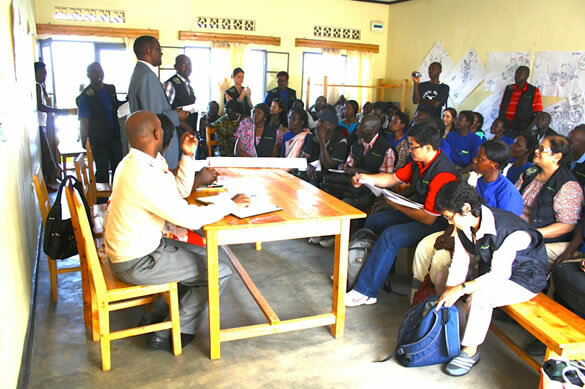 22 “routeros”, route participants from various IFAD-supported projects, implementing partners and civil society organizations have just started a 12-day journey across the districts and rural communities of Rwanda and the south of Uganda. As proudly said by the leader of the first hosting community visited “Participants comes from all over the world!”, and in deed there are people from Europe, Laos, India, Vietnam, Cameroun, Burundi, Zimbabwe, Uganda, Sierra Leone, Nigeria and of course Rwanda and Uganda. Most of them work as gender or M&E specialist in rural development projects. They are looking forward to see how the GALS methodology has improved the lives of a number of communities in the two countries, and enthusiastically say ”I am sure there could be a way of applying this to what I do!” . During the learning route participants will in fact develop their ideas into a concrete innovation plan, which will outline how they intend to bring new products, services or processes into their projects and organizations. The learning route will visit rural communities in three different districts, each one representing a case study. In each of the communities the following organizations have implemented the GALS methodology. 3. Bukonzo Joint and the coffee value chain development, Kyarumba town, Kasese district (Uganda). Stay to tuned to read what happened in these rural communities and how GALS have boosted value chains and by improving men and women relationships in the household .